Malian society can get very complicated in the eyes of a foreigner (and even toubabou) like me. I thought singer Belle Oumar Bella Sango was Sonraï. But apparently he sings in Peulh (or Fula if you like). And when I first saw them on Malian television and everybody was saying "Ah! Amadou Djeliba", I thought they were talking about the singer. But Amadou Djeliba appears to be the ngoni player. Here is a clip, so you can see why I was confused. 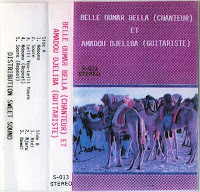 Nevertheless I just love the music of Belle Oumar Bella & Amadou Djeliba, and especially this classic cassette. P.S. I had some connection problems - more tomorrow. In any case, if we talk about folklore Peul the instrument that accompanies it is not the Ngoni, is the Hoddou! Ah Ngoni, you are a great help, and I really appreciate your comments! I knew about the Bella, but what confuses me is that in the track Njaaro he is called "Sango", - which as far as I know is a Sonraï name. Y find some relationship in the story of Njaaro,he mentions several Hamma Dicko family members who are always Tamacheck or Sonrai and later something about the Yerma. My friend Sonrai, confirmed that Belle Oumar is a Pourlo griot,well known in the region of Mopti, the name of Sango is Sonrai and corresponds to the lineage of griots, may be coming from his mother, but in any case if he speak Poular is a Pourlo, regardless of maternal origin that may have. As for the history he can not explain, because his knowledge of Poular is colloquial and is not completely understood. Anyway, he said that the recording is collected at the ORTM,and he likes it a lot and that is his music (the music that is heard in his region). Bela oumarou Bela Sangho is 100% a Fulaani griot from Youwarou, Mopti, Mali, and whoever say the contrry doesn't know the fulaani society of Mali. His name Bela has nothing the ethnic "bella" group of northern Mali. I've listened to him all my childhood, and know his son Bouya Bela. 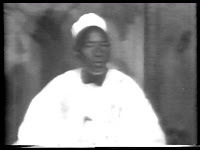 He was a poet, who knew how cheer a fulani by his words. I like the video, but there is a lot more you missing of this title ( Yoode) and not yone, which is is for warriors, and brave people. @Anonymous: The track "Lelli Yoo-Lelli Yooro" (A3 on the cover) is not on the cassette, and the track order on the B-side is also wrong. But I can assure you this is not due to edits by me. great track & thanks for the video on youtube, also!!! is there a track missing from the post? i count one less than is listed??? Salam ami Purlo, j'ai téléchargé une vidéo alléguée a Belle Oumar . Puis vérifier si c'est vrai ?